The International Builders Show is put together by the National Association of Home Builders, also known as NAHB. It is the biggest trade show for the light construction building industry in the United States. Not only that, but honestly it is the only event of its kind at all. The IBS focuses on the needs, concerns, and opportunities for all builders. Since it’s official start in 1998, the show has attracted over 100,000 attendees and keeps growing every year. Every year, the show is held in a different location. The 2015 show will be held in Las Vegas! Here is a view of the floor plan for exhibitors. As you can see the show is very conveniently connected to the Las Vegas Hotel and occupies the North, Central and South halls of the Las Vegas Convention Center. Note: NAHB reserves the right to change the floor plan (including, but not limited to, aisle space), without notice, to provide a more satisfactory, attractive and successful exposition. It is easy to become an exhibitor, just 4 easy steps. Step 4 Make payment by credit card, electronic check, wire transfer or company check. 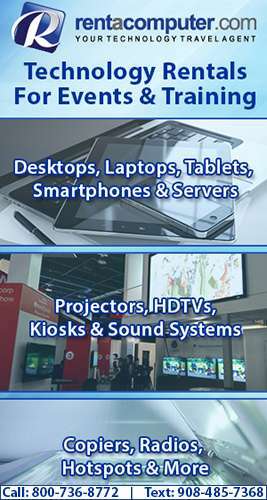 If you need audio visual, copiers, projectors, sound systems, iPads, iPhones or laptops, wireless cellular access points or other technology, we can help. Contact Rentacomputer.com at 800-736-8772 to reserve your technology for the NAHB IBS today! « Hey Vegas! Are You Ready For EventTech 2014?